New Life in Spain: Let me tell you how I was placed in my Spanish class. Let me tell you how I was placed in my Spanish class. The first day I came to the school about 15 minutes before my class was to start, as instructed. When I found a room marked “secretaría” I took a good bet it was the right place to start and got in a line. I didn’t know where to go or what to do so I hoped they would be able to inform me about that there. They didn’t speak English. 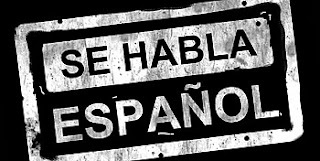 And I don’t speak Spanish. That’s basically why I am here... But this was a problem, cause they started rambling in full speed in Spanish and I had to politely try to stop them, ask them to please tell me in English what to do. ”Si.” Hah, I could answer them with one of the few Spanish words I know! “Room faiv.” She even wrote the number 5 on a note just in case. “Gracias!” With a smile that was not returned. I went on to look for room 5, and found it and got in another line. When it was my turn I stepped into the office, closed the door and sat down on the chair opposite the desk with the very scary teacher-lady. She looked at me with the same interest someone would look at the stinking garbage bag that should’ve been taken out two days ago. ”Hola” Trying my best smile again. Was not returned. Cool again, I also know what this means, why am I here. Feel better already. “Para estudiar español”. %&”¤(&”¤)&)”¤& <-- something totally not understandable, and I would not be able to reproduce it. In ENGLISH! I must be out of my mind, judging by the looks she gave me. Note to self: Apparently one’s not to speak English at this school. Ever. She scribbled a number onto a paper and shushed me out of her office, while shaking her head and mumbling words I would not know what mean, but I can only guess they were not nice ones. Oh well. Back out in the hallway I looked at the paper with the number 12 on it. I guessed I would find a door with the same number somewhere, and I did! The teacher came at the same time and I went in and took a seat, and my class started. Håper språkkurset går bra. Blir spennende å følge med på fortsettelsen. The Many Colours of Happiness: Yeah haha a little crazy! It wasn't the best first impression on the first day of school, I'll admit that! Hi! Thanks so much for your comment (at isawonderfulworld.com) ! I really like to know that people can appreciate it and makes me want to do more interventions! I'm really enjoying your blog as well! I also went to Spain to study Spanish and Art History (I went to Barcelona) and I can relate to everything you're describing! But don't worry, it will only get better and soon enough you won't want to leave it! 95 hours of Spanish course done! A little Spanish lesson at Mesón "Lo Güeno"
The best napolitana in town? Try La canasta. Playa de Pedregalejo & decision made! How addresses work in Spain, very confusing! Lost in translation - Rent a boyfriend! When are Spanish children put to bed?